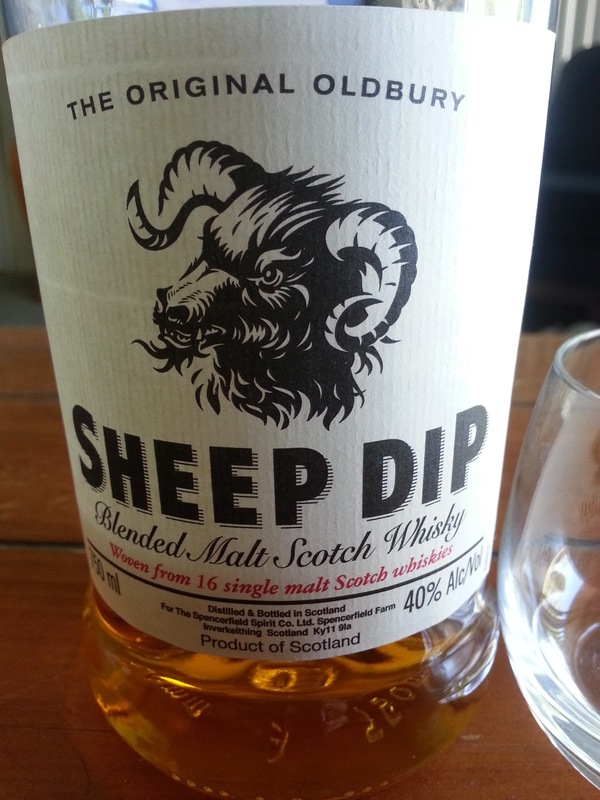 A wonderful scotch whiskey and a great story, Sheep Dip is a blended malt scotch whiskey from Spencerfield Spirit Company in the Kingdom of Fife, Scotland. I was prompted to try Sheep Dip by its listing in Ian Buxton’s 101 Whiskies to Try Before You Die. 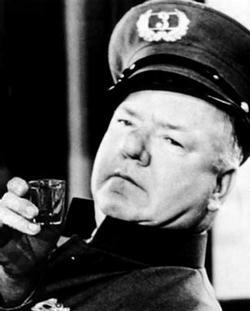 One of these days I’ll write a post about my own family’s history with home distilling. Almost a hundred years ago, my Grandfather and his brothers and cousins ran stills in the mountains of North Carolina and Wyoming. It is a great story with a rich history of incidents with law enforcement. Some of my earliest memories are of my dad’s brothers visiting us and bringing moonshine from NC. But back to Sheep Dip. This is my kind of Scotch. It has a light floral, fruity smell with warm hints of honey and smoke. It has no heavy peat taste that (at this time) doesn’t appeal to me. This light and warm blend of malts, honey, and spices is a perfect introduction to Scotch, in my opinion. A much better choice than the bottom shelf Scotches that many people try for the first time then declare that they don’t care for Scotch. Try it neat. Sheep Dip is a 40% APV (80 Proof) and shouldn’t require much, if any, cutting. Perhaps a few drops of water to suit your taste. I have seen comments that Sheep Dip can be hard to find. Not my experience at all. 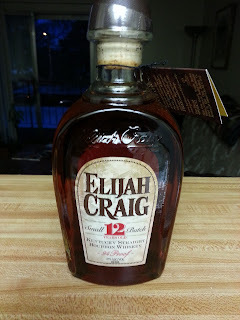 I recently picked up a bottle at BevMo at a very reasonable price. Spencerfield Spirit Company is wholly owned and run by Alex and Jane Nicol. The story of the creation of this company and how Sheep Dip got started is told in Buxton’s book and at the Spencerfield website. Check it out and fall in love with this entrepreneurial story. If you try Sheep Dip with a cigar, select a lighter flavor cigar. Bolder heavier flavors will easily overwhelm Sheep Dip's light subtle flavors. 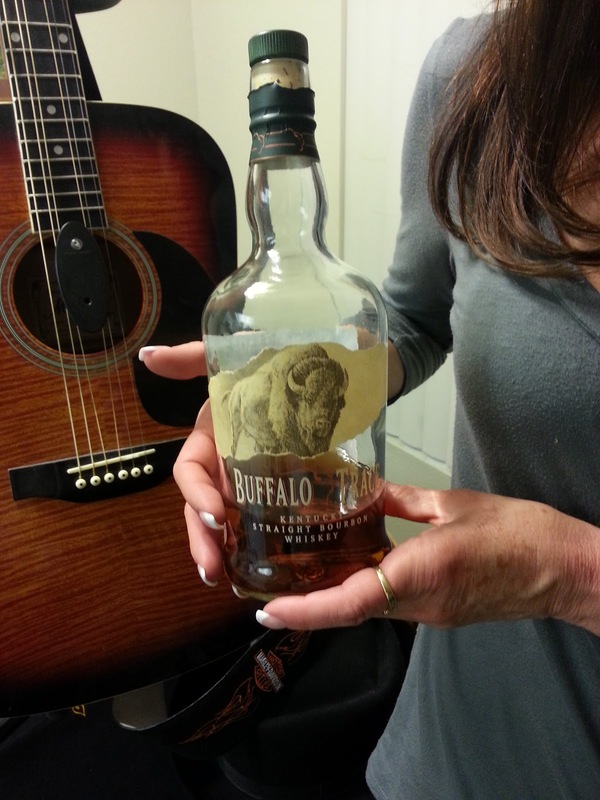 As a fan of bourbons, Buffalo Trace, was destined to be a favorite of mine. It is such a pleasure to drink (neat with a splash of water), and is very reasonably priced. I always have a bottle in my cabinet and it is one of my “go to” standards. More than just a spirit, more than just whiskey, this bourbon is a tribute to all that is uniquely American - a celebration of our country's rugged history, its fight for freedom and independence, and the fierce pride governing its heritage. Inside each bottle is the essence of courage, a sense of adventure, a quest for the unknown and a thirst for discovery. This is the legend and legacy of our rich ancestry, captured and embodied by Buffalo Trace Distillery. Buffalo Trace has an excellent aroma and on first sip has a bit of a spicy bite (one reason why I like to add a little water). It delivers the satisfying smoky warm flavors that make me love bourbon, with hints of vanilla, honey (or maybe molasses), mint, and a tang of orange. It is a beautiful golden color. The finish is smoky, tangy, and leathery, with hints of tobacco. 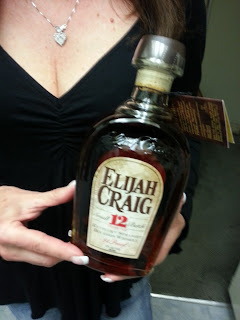 An excellent bourbon to accompany a fine cigar. Buffalo Trace is the flagship bourbon from the distillery. But the Buffalo Trace Distillery has an immense selection of labels. Check out the distillery’s website to learn more about Buffalo Trace's fine products. All in all, I can't recommend Buffalo Trace highly enough. I predict it will become a staple in your liquor cabinet. Researchers identify health benefits to drinking moderate amounts of alcohol, especially whiskey. 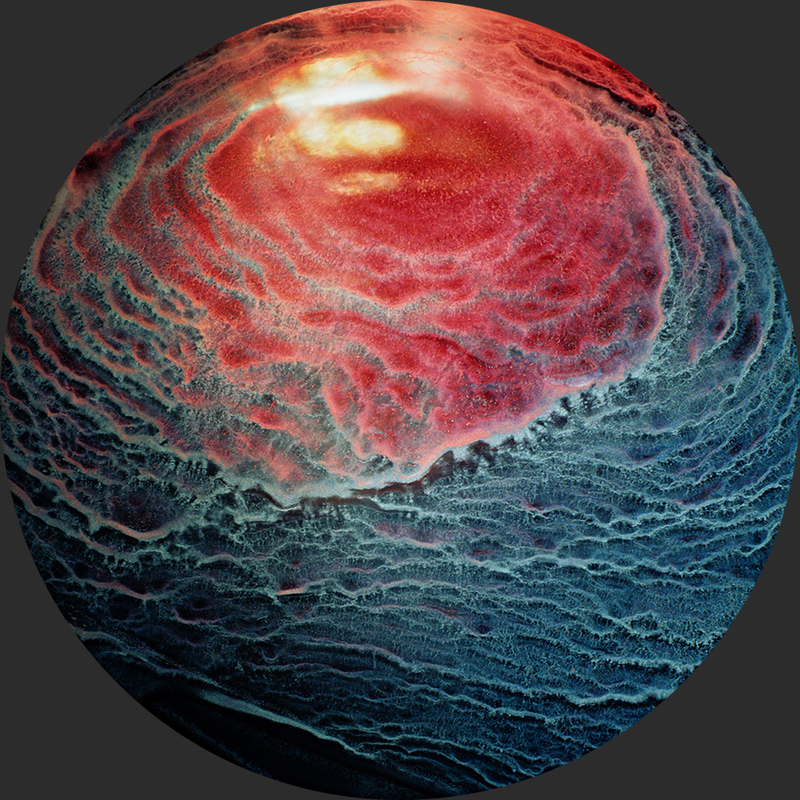 "Whiskey is a grain-derived alcohol that is created by fermenting rye, barley, wheat or corn. 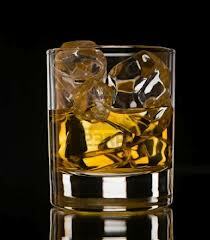 People all over the world make and drink the different varieties of whiskey, and each whiskey has a distinct taste. Although any type of alcohol can be deadly in excess, the medical community has found some health benefits to drinking moderate amounts of alcohol, especially whiskey." Now you can relax and enjoy your drink. Today, as you search for the perfect drink to celebrate the Irish, consider the many great Irish Whiskies. Here are three that I sampled recently at a wonderful Irish bar in Washington D.C. a week ago in anticipation of this great day. First, the bar! The Irish Whiskey. If you are in the D.C. area today, I don't think you can do better than the Irish Whiskey. Stop in and meet the friendly staff. Our bartender had several recommendations as well as a engaging personality. A great time! 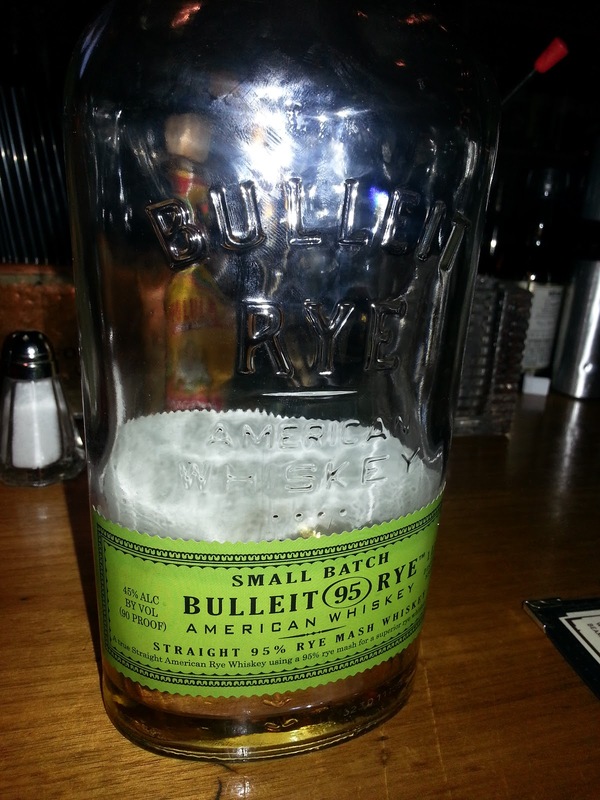 All right, I'll admit it, I am a huge rye fan and love the fact that it is on the rise in popularity. Get a bottle of Michter's single barrel rye whiskey, pass on the green beer, and enjoy a day with this smooth and mellow whiskey. Even though this is an American Whiskey (Est. 1753), it was served to me at The Irish Whiskey, SO CLOSE ENOUGH! 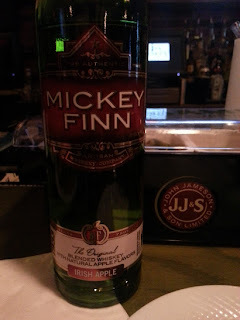 So this whiskey (Mickey Finn Apple Whiskey Liquor) wasn't really my "cup of tea," but I long ago realized (with the help of my son Tim at age 4 as I tried to get him to enjoy tomatoes) that "Not everyone likes the same things." 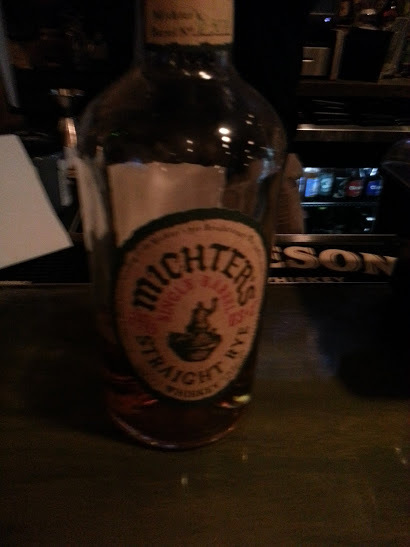 Order a shot of Mickey Finn when you are ready for a change of taste or a break from the Michter's. This whiskey has a strong green apple taste which is delicious, but a little too cloying in my opinion. The other issue that gives me pause is that although this is marketed as an Irish whiskey, Mickey Finn is also an American. O for 2... What kind of Irish theme is this? OK, so as you will find, I am not a purest and I am always willing to roll with marketing themes, so I salute Mickey Finn's slogan "American By Choice, Irish By Nature" and offer this whiskey as you celebrate St. Patty's. A great way to end your evening. This sweet, smooth whiskey is like slipping into a delicious, warm bubble bath. It is delicious, rich, with a hint of vanilla (or is that butterscotch). Unlike the Mickey Finn's, this is not too sweet and does not seem too rich or wear you out as you enjoy a glass. 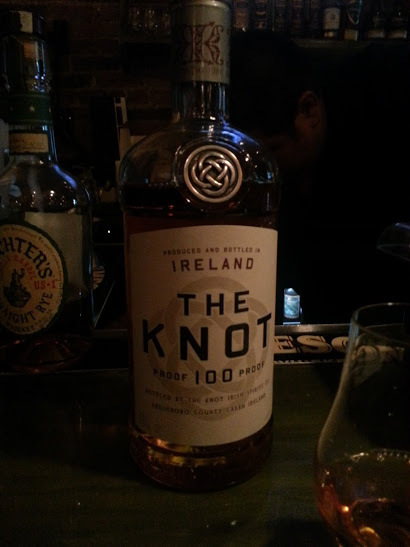 Definitely try the Knot as a pinnacle to your Irish celebration. 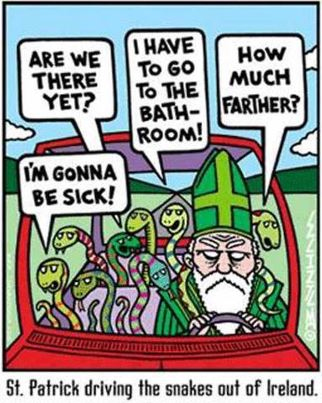 So have a Happy St. Patrick's Day, sport the Green, enjoy your family and friends, and most importantly, enjoy a fine whiskey.